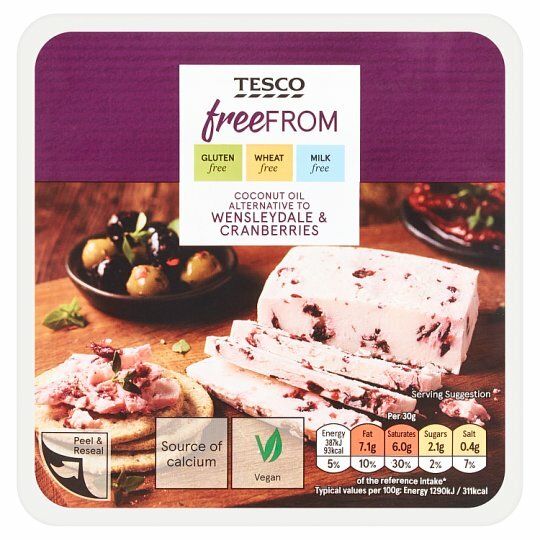 Gluten free coconut oil and oat fibre alternative to Wensleydale cheese with sweetened dried cranberries, enriched with calcium. INGREDIENTS: Water, Coconut Oil (22%), Modified Potato Starch, Sweetened Dried Cranberries (8%), Maize Starch, Salt, Flavourings, Oat Fibre, Tricalcium Citrate, Thickeners (Carrageenan, Guar Gum), Modified Maize Starch, Acidity Regulators (Lactic Acid, Sodium Lactate), Yeast Extract, Colour (Mixed Carotenes). Sweetened Dried Cranberries contain: Cranberry, Sugar, Sunflower Oil.